Dieting can be tough over the holidays! You not only have to watch how much you eat, but also what you eat. This is especially true if your weight loss plan includes a keto diet! After all, no one wants to show up as a respectful guest only to turn down all the food your host has graciously provided. Thankfully, you don’t have to stress about having a keto Thanksgiving—at least not about the food. Unfortunately, there’s nothing I can do about your annoying father-in-law! A keto—short for ketogenic—diet is a popular fat-loss diet. By eliminating starchy carbs and most other forms of carbohydrates, the keto diet switches your body’s preferred fuel source from glycogen to fat. Glycogen is sugar stored in your muscles and other cells to provide energy. When glycogen stores are depleted and not refilled, your fat cells start breaking down to produce “ketones,” to provide energy in their absence. The longer you go without carbohydrates, the more fat you use as fuel. So what do you eat on a keto diet? Keto foods include those high in fat and protein, as well as leafy greens. The classic ketogenic diet stipulates that 75% of your calories come from fat, 20% from protein, and just five percent from carbs. For a 2,000-calorie diet, that’s only about 25 grams of carbohydrates per day. The modern and more common style of keto, however, has a “friendlier” macro breakdown: 40% to 60% of calories from fat, 20% to 40% from protein, and 20% from carbs (100 g for a 2,000-calorie diet). Although this won’t keep you in a constant state of ketosis, you won’t experience most of the undesirable effects of running on ketones all the time—mental fogginess, low energy, and having to meticulously research every food you eat. So, a little bit of cranberry sauce or sweet potato on Thanksgiving won’t completely derail you, but you’ll probably have to avoid the pie! To your benefit, keto diets are super-popular these days and you may find you’re not the only one around the table trying to stay on point. Consider contacting family and friends ahead to see who else might be doing the keto diet. Perhaps you can work together and supply a few keto-friendly dishes of your own. We’ll cover some tasty keto Thanksgiving recipes a little later on. What Kinds of Foods Can You Eat for a Keto-Friendly Thanksgiving? Personally, I would say go ahead and eat whatever you want on Thanksgiving. A keto Thanksgiving cheat day isn’t going to totally derail your diet. At most, it might take it a few days for your body to get rid of the glycogen and return to ketosis—as long as you don’t take home any carb-rich leftovers! You may actually find your weight drops a bit because of the shock to your metabolism—especially if you’re engaged in a workout routine. But if you want to know how to stay keto on Thanksgiving, you’re going to want to focus your attention on some festive foods while ignoring others. You can eat turkey all day—white meat, dark meat, and the skin—on keto. Thanksgiving stuffing, on the other hand, will need to be avoided. That is, of course, if it’s made from breadcrumbs and other starchy carbs. If it’s got dried apricots and cranberries (very high in sugar), you may also want to keep your intake down. But, if it’s stuffed with more meat like quail or duck, you’re in luck! A ham could be a little more difficult to navigate. If the ham’s been cooking in brown sugar and pineapple, it’s not keto. Thanksgiving ham, to be keto-friendly, can be seasoned with salt, pepper, and other non-sugary spices, and topped with the mustard of your choice. When it comes to green veggies like beans, Brussels sprouts, and the like, go to town. Add some butter and enjoy! Other veggies like the seasonal beetroots, squash, and turnips can be consumed in small doses. You could serve yourself a small spoonful of each to get the flavor, but don’t go too deep. Bottles get opened and the booze flows freely during the holidays, and chances are you’re going to indulge in at least a glass. And make no mistake about it—alcohol is not healthy for your body or mind. Because it’s essentially poison, it hijacks your metabolism and will immediately take you out of ketosis as your body tries to get rid of it. But hey, it’s Thanksgiving, so why not have a glass or two? All alcohol contains some carbohydrates (sugar), and there are certainly better choices than others for someone following a keto diet. Alcohol is a kind of hybrid carbohydrate that has seven calories per gram (traditional carbohydrates have four). Therefore, hard liquors officially have no carbohydrates, but range from 95 to 105 calories per shot (and they sure aren’t coming from protein or fat!) At most, stick to two drinks. Straight hard liquor: Take it neat or on the rocks. Don’t mix it with a sugary soda, juice, or syrup. Dry white wine: Usually has up to three grams of carbs per five-ounce glass. Dry red wine: Usually has between three and four grams of carbs per five-ounce glass. Low-carb or dark beer: Low-carb beers have two to three grams of carbs per 12-ounce can, whereas dark beers have around nine grams of carbs but less than one gram of sugar. Stouts are also very high in antioxidants. After-dinner wines like Moscato, Port, and Sherry. When it comes to desserts, things can get pretty difficult if you’re trying to eat keto. This is where you’ll want to volunteer your services or talk to other friends and family members following keto about contributing, because I’ll tell you right now, the traditional desserts will be untouchable. For desserts, focus on keto-friendly items like nuts, nut butters, and keto-specialized baking products. Don’t worry, though, we’ve got a good idea for you below! Whether you’re hosting a keto-friendly Thanksgiving party or attending one that will need some dishes to fit your diet, you’re going to want to make sure there are tasty items available. Fortunately, most fatty, cheesy dishes taste great and go with anything, so finding suitable keto options won’t be a massive struggle. We’ll focus our attention here on sides, appetizers, and desserts, because most main meat dishes will fit your keto diet. Preheat oven to 450 degrees Fahrenheit. While waiting for it to heat up, peel carrots and wrap each in a strip of bacon and place on a baking sheet. Bake for 25 minutes or until the carrots are tender and the bacon is crisp. You can do similar recipes with similar instructions by wrapping zucchini or asparagus in bacon. You can also use prosciutto or other meats. Preheat oven to 350 F. In a large, nonstick pan over medium heat, cook the bacon until crispy. Drain the excess grease, then chop. In a large bowl, combine the cream cheese, mayo, sour cream, paprika, and garlic powder and stir, seasoning with salt and pepper to taste. Mix in chopped spinach, bacon, three-fourths cup of the mozzarella, and parmesan. Place the dip in a baking dish and sprinkle the remaining one-fourth cup of mozzarella on top. Bake for 25 to 30 minutes until the dip is golden and bubbly. In a large, nonstick skillet, cook bacon until crispy. Drain grease and finally chop. Set aside. In a large bowl, stir together cream cheese, cheddar cheese, garlic powder, and paprika. Season with salt and pepper. Use a cookie scoop to form the mixture into 18 small balls and transfer to a baking sheet lined with parchment. Refrigerate until firm, about one hour. In a shallow bowl, stir together bacon, chives and pecans. Roll balls in the bacon/chive/pecan mixture and insert a toothpick into each. Let sit at room temperature for about 15 minutes before serving. If you’re not serving them right away, cover with plastic and put back in the fridge. Let’s face it, sides are really where it’s at for the holidays. Here are some friendly keto Thanksgiving side recipes. Melt butter in a large skillet over medium heat. Add onion, carrot, and celery and sauté until soft, for roughly seven minutes. Add cauliflower and mushrooms. Season with salt and pepper. Cook until tender, for about another eight minutes. Add parsley, rosemary, and sage and stir until well blended. Pour over vegetable broth and cover with a lid. Cover until veggies are totally tender and the liquid is absorbed, or about 15 minutes. In a large pot of salted boiling water, blanch cauliflower florets for three minutes. Drain and squeeze out any excess water. For the cheese sauce: Melt the butter in a large skillet. Add the garlic and cook for about one minute. Add flour and stir until golden, for about two minutes. Next, pour in the milk and bring the mix to a low simmer, then add cream cheese and whisk until combined. Remove from heat and stir in one cup of the cheddar cheese until melted. Season with salt and pepper. Add the drained cauliflower to a 9×13-inch dish. Pour the cheese sauce over the veggies and stir until combined. Add in all but one tablespoon each of the cooked bacon and green onions and stir until combined. Then top with the leftover cheddar, bacon, and green onions. Bake until cauliflower is tender and the cheese is melted, or about 30 minutes. You can get by with cranberry sauce over the holidays, but just make sure it’s not the store-bought variety that’s loaded up with sugar. Here’s a very low-carb cranberry recipe to give you a taste of the season! Cranberry can never be fully keto because the fruits are high in sugar, but this option is about as low-carb as you’ll find! Remember to stick to a couple of tablespoons only. Add the cranberries and water to medium saucepan and heat over medium heat. Let it reduce until you achieve a thick consistency. After about eight to 10 minutes, the cranberries will burst. Once the mixture is fully reduced and thickened to your liking, remove the pan from heat and stir in the chia seeds and liquid stevia. Pour the sauce into a sealable container and store it in the fridge or serve immediately. Combine cream, butter, and broth/drippings in a saucepan over medium high heat. Bring to boiling and then reduce to a simmer for 10 to 15 minutes. Add xanthan gum and pepper. Stir until gravy thickens and reduces down to consistency of your liking. Line an 8×8-inch baking dish with parchment paper. In a medium bowl, combine the peanut butter, coconut flour, powdered sugar, vanilla, and salt. Blend well, stirring until smooth, and pour the mixture into the prepared pan. Use a spatula to smooth out the top. Place the pan in the freezer for 30 minutes to firm up. Combine the chocolate chips and coconut oil in a medium-sized, microwave-safe bowl. Microwave, stirring every 30 seconds, until the mixture is smooth enough to pour. Pour the chocolate blend over the peanut butter layer and smooth the surface. Garnish with coarse sea salt and place in freezer to harden, for at least two hours and up to overnight. When you’re ready to serve, remove the peanut butter bars from the baking dish and cut into equal-sized squares. If you don’t want to use keto-friendly chocolate chips, you can make your topping from protein powder and water. For whey, use one-fourth to one-third cup of water per 1.5 scoops of protein and stir until a pudding-like consistency is formed. Spread on top of peanut butter. Going out of ketosis for a day or two over the holidays won’t shatter your progress or put you off-track. If you can, forget about the keto diet on Thanksgiving Day and just go with the flow. Just remember to get back to your diet the next day. Stay away from store-bought goods, potatoes, stuffing, and the traditional fixings if they are filled with carbs. Things like turnips, squash, and beets can be consumed in small amounts. Avoid the pies and ice cream. Eat the meat—turkey, ham, duck, and all the rest of it fit nicely into your keto diet, skin included! Max out at two drinks and avoid mixed drinks, cocktails, coolers, and regular beer. Volunteer to bring a keto-friendly side, appetizer, or dessert. Your host will be even more thankful for your attendance! 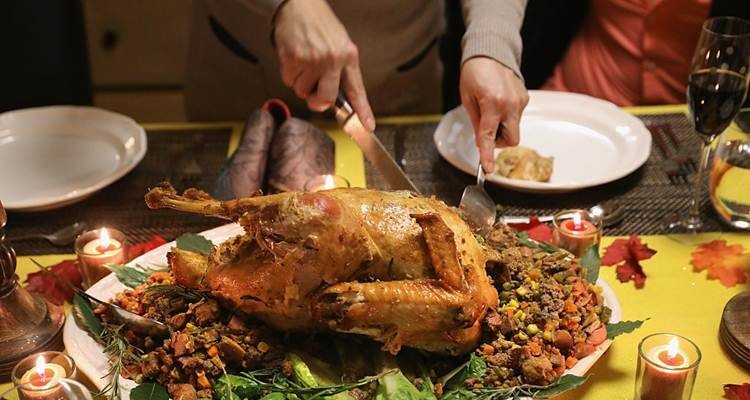 Thanksgiving Leftover Recipes: Turkey Soup, Pumpkin Curry Soup, Leftover Salad and More! White, P., “The Expert’s Guide to Drinking Alcohol on a Ketogenic Diet” Onnit, June 19, 2018; https://www.onnit.com/academy/experts-guide-alcohol-ketogenic-diet/, last accessed November 12, 2018. Flager, M., “15 Keto Thanksgiving Recipes That Will Keep Your Diet on Track” Delish, August 2, 2018; https://www.delish.com/holiday-recipes/g22628933/keto-thanksgiving-recipes/, last accessed November 12, 2018. “Healthy Cranberry Sauce | Low Carb, Keto Friendly!” Keto Connect, 2018; https://www.ketoconnect.net/healthy-cranberry-sauce/, last accessed November 12, 2018.